As the Pigford I settlement comes to fruition, the Network of Black Farm Groups and Advocates reflects on the efforts to address decades of discrimination against black farmers. This post was originally published by the group last week in the Nation Builders. The Pigford I settlement is based on the court case Pigford v. Glickman (1999), which was a class action lawsuit against the United States Department of Agriculture. The case brought charges of racial discrimination for the period between 1983 and 1997 in the USDA’s allocation of farm loans and assistance. The case brought forward evidence that black farmers were treated unfairly when distributing farm ownership loans, operating loans, disaster payments, and price support loans. The USDA also failed to respond to subsequent complaints of race-based discrimination. The Pigford consent decree on April 14, 1999 marked the first step to offer compensation for thousands of black farmers who faced decades of discrimination from the US Department of Agriculture. That first step is now coming to a close. In fact, recently, a motion was filed to “wind down” the Pigford I consent decree. 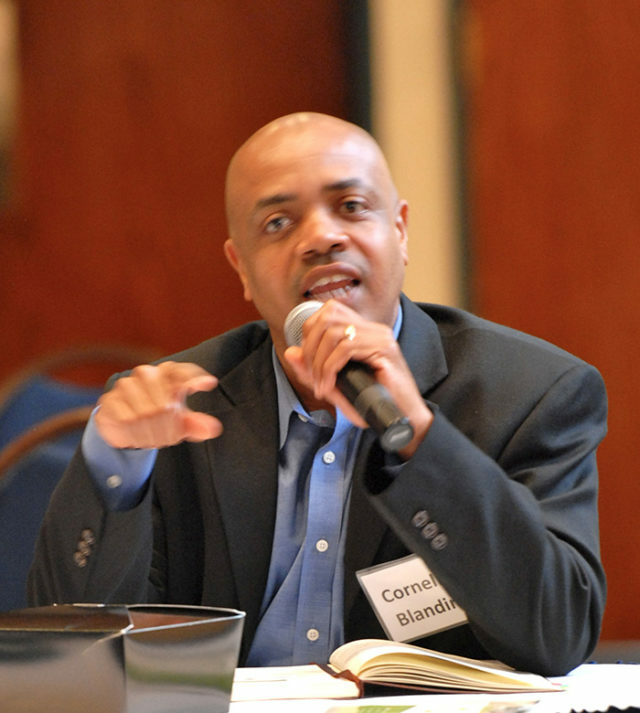 Fourteen years later, as the commitments in the settlement are complete, the Network of Black Farm Groups and Advocates reflect on the history of USDA discrimination against blacks and reasons for the suit. The lawsuit filed against the U.S. Department of Agriculture in 1997 (known as Pigford v Glickman) was to address the discriminatory behavior Black farmers, or those attempting to farm, experienced at USDA offices between January 1, 1981 and December 31, 1996. But this 16-year period is just the tip of the iceberg for the long-standing discrimination Blacks have experienced at USDA offices throughout the country and, in fact, throughout the history of the USDA. The dates for the suit were chosen because the Reagan administration abolished the USDA’s office of civil rights in the 1980’s and the Clinton administration reinstated the office in the 1990’s. So, for these 16 years, if Black farmers filed a discrimination complaint with the USDA, their complaints were not addressed as there was no one at the USDA with responsibility to do so. What service should USDA staff have offered Blacks who requested loan applications or information about farm programs? The regulations state, for one, that the USDA should have offered assistance with the application and assistance to the applicant to determine what program or programs would best meet his or her needs. Also, written applications should have been encouraged and then accepted and further, written applications should have been encouraged by USDA, even if funding was not available at the time, since once funding did become available, applications were considered in the order received. 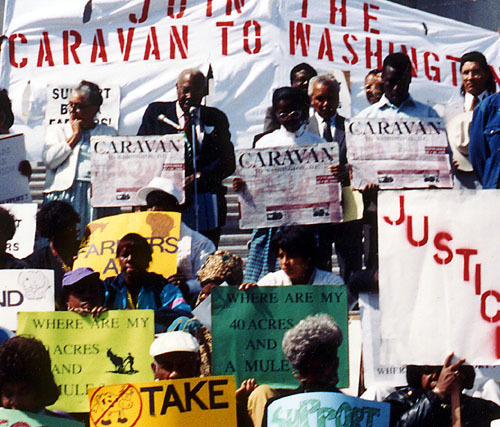 The Federation of Southern Cooperatives / Land Assistance Fund led the first black farmer “Caravan to Washington” in 1992. Photo courtesy of the Federation/LAF. There are other regulations as well, of course, but most Black farmers never got beyond the secretary to the supervisor or loan officer to even talk about what they needed, much less being handed a loan application form. Violations of the above regulations and many others between 1981 and 1996 toward Black clients by the USDA staff was rampant but, as mentioned, the behavior by USDA staff was not isolated to this 15-year period. In fact, if there was ever a lawsuit with documentation citing discriminatory practices by a US government agency, the treatment of Blacks by the USDA is perhaps one of the most compelling and most cited. 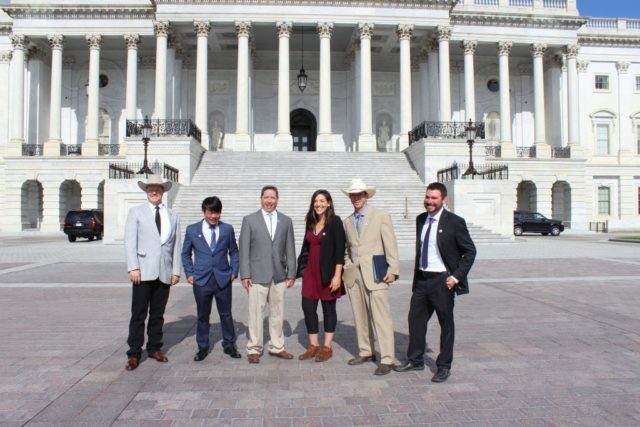 Report after report since the 1930’s New Deal farm programs and up the present have demonstrated on-going discriminatory practices by the USDA. Historian James Cobb, in his book The Most Southern Place on Earth: the Mississippi Delta and the Roots of Regional Identity (1992), mentions the abuse of the Agriculture Adjustment Act (AAA) program. Cobb and others, such as Howard University professor E.E. Lewis (1935), note this abuse was rampant in the Mississippi Delta and elsewhere in the South. With USDA knowledge, powerful cotton planters made sure the allotment payments were filtered through them, rather than directly to their tenant farmers or sharecroppers. As a result, as little as possible of this money went to the tenants or sharecroppers. White planters in the South, in fact, made huge amounts of money through this corruption at the expense of Black farmers and this entitlement of white privilege in having the first access to USDA funds has been maintained to the present time. Other reports include the U.S. Commission on Civil Rights research results in 1965, 1967 and 1982 finding that discriminatory behavior by the USDA staff was on-going and having a devastating impact on Black farmers. In fact, in 1982 the Commission reported that the main reason Blacks have lost land is because of the USDA itself and its lack of service to the Black community. 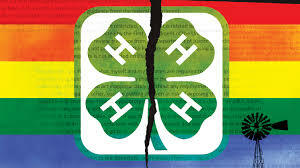 Congress and the USDA itself have conducted numerous studies on civil rights abuse and discriminatory behavior by the USDA. The USDA reports on discrimination include the Miller “Disparity Study” (1996) that found that from 1990 to 1995, minority participation in FSA programs was very low and minorities received less than their fair share of USDA money for crop payments, disaster payments, and loans. Under the Obama administration another USDA study entitled “Civil Rights Assessment” (2011) again found disparity in the treatment of whites versus blacks in USDA programs. Following the listening sessions, Secretary Glickman commissioned a USDA Civil Rights Action Team (CRAT). It is important to note that this was the USDA’s own self-study and review. And further, it is also important to note that at the outset CRAT admitted discriminatory treatment of minority farmers by the Department and then explored ways to resolve these problems. The CRAT report was known as “A Time of Act” (1998). President Obama signs appropriations after the Pigford settlement. Photo courtesy of the Federation of Southern Cooperatives and Land Assistance Fund. Finally, after decades of studies and reports citing discrimination experienced by Blacks at USDA offices, and after excessive loss of Black-owned land, families destroyed, and thousands of Blacks leaving the South because, for one, of lack of services and loans by the USDA, the Pigford lawsuit was settled in 1999 to begin at least some redress of this painful discriminatory behavior. 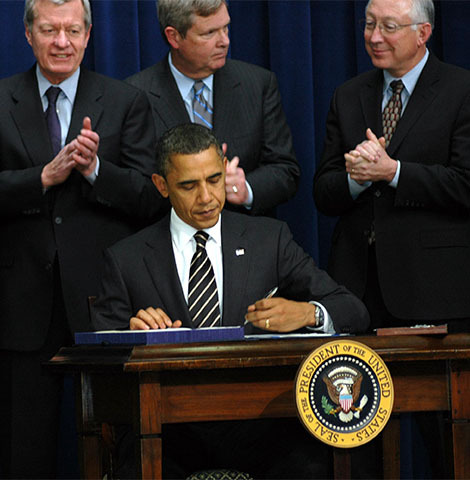 President Obama’s USDA Secretary Thomas Vilsack, in fact, began, at the outset of his service in 2009, to implement various programs at USDA to address the historic discrimination throughout his agency. Yet much still needs to be done.